Who Survived More Lightning Strikes, Roy Sullivan or Melvin Roberts? 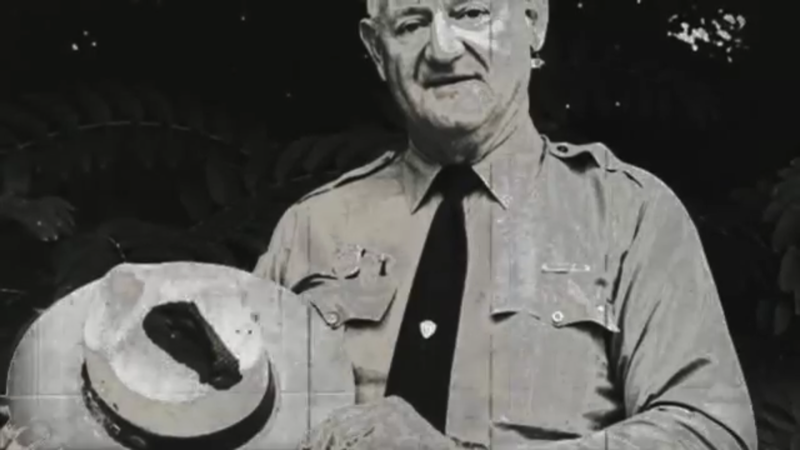 Today’s stop on our world tour of true strange stuff: two “human lightning rods.” The first is Roy Sullivan, a bear smacking park ranger who survived being struck by lightning seven times. Who else ever (quite reasonably) kept a bucket of water handy in his truck for when his hair caught on fire? Roy Cleveland Sullivan (February 7, 1912 – September 28, 1983) was a United States park ranger in Shenandoah National Park in Virginia. Between 1942 and 1977, Sullivan was hit by lightning on seven different occasions and survived all of them. For this reason, he gained a nickname “Human Lightning Conductor” and “Human Lightning Rod”. Sullivan is recognized by Guinness World Records as the person struck by lightning more recorded times than any other human being. In [a] photo of him … a prominent burn mark is visible on his ranger hat. The details are an astounding read. The first documented lightning strike of Sullivan occurred in April 1942. He was hiding from a thunderstorm in a fire lookout tower. The tower was newly built and had no lightning rod at the time; it was hit seven or eight times. Inside the tower, “fire was jumping all over the place”. Sullivan ran out and just a few feet away received what he considered to be his worst lightning strike. It burned a half-inch strip all along his right leg, hit his toe, and left a hole in his shoe. He was hit again in July 1969. Unusually, he was hit while in his truck, driving on a mountain road—the metal body of a vehicle normally protects people in cases such as this by acting as a Faraday cage. The lightning first hit nearby trees and was deflected into the open window of the truck. The strike knocked Sullivan unconscious and burned off his eyebrows and eyelashes, and set his hair on fire. The uncontrolled truck kept moving until it stopped near a cliff edge. In 1972, Sullivan was working inside a ranger station in Shenandoah National Park when another strike occurred. It set his hair on fire; he tried to smother the flames with his jacket. He then rushed to the restroom, but couldn’t fit under the water tap and so used a wet towel instead. Although he never was a fearful man, after the fourth strike he began to believe that some force was trying to destroy him and he acquired a fear of death. For months, whenever he was caught in a storm while driving his truck, he would pull over and lie down on the front seat until the storm passed. He also began to believe that he would somehow attract lightning even if he stood in a crowd of people, and carried a can of water with him in case his hair was set on fire. On August 7, 1973, while he was out on patrol in the park, Sullivan saw a storm cloud forming and drove away quickly. But the cloud, he said later, seemed to be following him. When he finally thought he had outrun it, he decided it was safe to leave his truck. Soon after, he was struck by a lightning bolt. Sullivan stated that he actually saw the bolt that hit him. The lightning set his hair on fire, moved down his left arm and left leg and knocked off his shoe. It then crossed over to his right leg just below the knee. Still conscious, Sullivan crawled to his truck and poured the can of water, which he always kept there, over his head, which was on fire. On Saturday morning, June 25, 1977, Sullivan was struck while fishing in a freshwater pool. The lightning hit the top of his head, set his hair on fire, traveled down, and burnt his chest and stomach. Sullivan turned to his car when something unexpected occurred — a bear approached the pond and tried to steal trout from his fishing line. Sullivan had the strength and courage to strike the bear with a tree branch. He claimed that this was the twenty-second time he hit a bear with a stick in his lifetime. All seven strikes were documented by the superintendent of Shenandoah National Park, R. Taylor Hoskins. Sullivan himself recalled that the first time he was struck by lightning was not in 1942 but much earlier. When he was a child, he was helping his father to cut wheat in a field, when a thunderbolt struck the blade of his scythe without injuring him. But because he could not prove the fact later, he never claimed it. Next, meet super human lightning attractor Melvin Roberts. A video made after he’d been struck six times tells what it was like. Here’s another news report, at which point Melvin Roberts claimed he had been struck 10 times. New world record, if verifiable. Here’s what he said the experience was like. ‘It’s like grabbing an electrical cord. You don’t feel the burns until it’s over with,’ heavily-scarred Roberts told ABC News. … Roberts made headlines in 2011 when a lightning rod struck his watch – the sixth time he was zapped. His wife Martha said he’s been hit four times since. Are the claims of Melvin’s wife Martha accepted? At number 11 there was not enough medical evidence, so he was not included. A 62-year-old man from South Carolina, Melvin Roberts, claims that he has been struck by lightning 11 times in the last 12 years. However, the Guinness World Records says there isn’t enough medical evidence to include him on their list. Officially, then, the record is seven verified lightning strikes. The unofficial and unverified claim is 12 strikes. Let’s look at the odds of being struck by lightning in the USA. The answer depends on who you ask and what historical time period is considered. The odds of being struck by lightning in any one year in the US is 1 in 700,000. The odds of being struck in your lifetime is 1 in 3,000. That’s quite a difference, but for the sake of calculations, let’s go with the lesser National Geographic estimate of 3,000 to 1 odds against getting hit during an average American lifespan of 80 years. The probability of an event is the number of ways it can happen divided by the total number of outcomes. If your odds are 1 in 3,000 of one strike in a lifetime, what are the odds of two strikes in one lifetime? Let’s look at a simpler example first. What are the odds of getting at least 1 “heads” in two fair coin tosses? There is a 50% chance of heads on 1 toss. Most people get that. For two coin tosses, the total possibilities are: 1. two heads, 2. two tails, 3. heads then tails, and 4. tails then heads. This can be written in shorthand. In three of those four ways two tosses can happen, a head appears. Therefore the odds are 75% in favor. In other words, it is almost 100% certain you will be struck twice! Uh, no, wait… what did we do wrong? We calculated the odds of not being struck twice by lightning in a lifetime. Said another way, the odds are that someone will be struck twice once every 9 million lifetimes. Chances of being struck by lightning once in a person’s lifetime are one in 3,000, according to the National Weather Service. But chances of being struck by lightning twice in a lifetime are one in 9 million. The odds are that once ever 2.187 oktillion lifetimes, someone will be struck by lightning seven times. If you think that number sounds pretty crazy, it is. By one October 2011 estimate, 6.5 percent of all people ever born are alive today. If there are 7.13 billon people alive right now, then the number of humans who ever lived is 1,426,000,000,000/13 or about 109.6 trillion, ridiculously less than the 2 oktillion lifetimes the odds say it would take for this to happen. What does this mean? Either my calculations are wrong, the odds are wrong, or this universe is not behaving according to probabilities as it should. To some, this is a sign that we are living in a simulation which allows unlikely things to happen. This keeps our virtual lives interesting and makes for a better earth amusement park. There is also the fact that both men survived all stikes by lightning which they experienced. A lightning strike transfers several 100 million volts of electrical charge. What are the odds of dying from a single strike? As an aside, the idea of “earthing” is that walking barefoot on the earth can protect your body from damage by free radicals. Some people even sleep on special conductive grounded sheets for the supposed health benefits. My advice, when the universe seems crazy, change the subject and ignore the absurdity. Either that or I try to realize that if someone can get struck by lightning seven times, I can invent anti-gravity, sell it for $300 billion, cure cancer, make old age optional, get the world working together, clean up the planet, colonize a few more backup planets, write a few 100 excellent songs, and find love again. What would you do in an absurdly improbable universe? Guess what? You’re doing it. Have fun out there. Strange things happen, despite the odds. « What did you do during the eclipse?